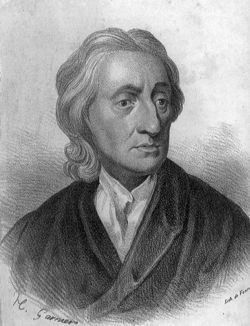 A portrait of John Locke, philosopher, leader of British empiricism. Empiricism in the broad sense contains types of verification of language but by experience as always the means of epistemic justification. Empiricism deals with a posteriori knowledge as opposed to a priori which is knowledge gained independent of experience. The human sensory system, specifically observation, allows Justified True Belief (as it is called within epistemology) or knowledge within science as an intellectual discipline. Sense experience is personally received from the external world and therefore is the consequence of scientific experimentation, actually being measurable to the individual. Data mined from a scientific method presupposes the reliability of the sensory system making it a foundational belief for empirical knowledge. Empiricism underpins science and as a theory of knowledge deals with the meaningfulness of propositions. Specifically scientific propositions which capture a specific array of language, namely scientific language, which is considered by empiricists as the only cognitively sensible way to talk. Empirical propositions are the intended meanings of thoughts about a declarative statement that can be verified by the five senses of a human being. This empirical theory of meaning requires any proposition, not able to be directly experienced by the senses, to be meaningless and nonsensical. Some major names within the history of empiricist philosophy are; John Locke (1632–1704), George Berkeley (1685 to 1753) and David Hume (1711 to 1776). John Locke is especially credited as being the main founder of empiricism specifically and was also very important to the whole development of western philosophy generally. One of the classic debates regarding empiricism happened between Locke and George Berkeley. After the publishing of An Essay Concerning Human Understanding by Locke, Berkeley understood it to lead to a philosophy of atheism and then published his work titled Treatise Concerning the Principles of Human Knowledge in 1710. In attempt to rebut the epistemology of empiricism, Berkeley although generally thought of as an empiricist in effect started a classic debate of empiricism and rationalism, a famous juxtaposition within the history of western philosophy still explored today. Thomas Reid (1710 to 1796), a contemporary of David Hume and so both Scottish philosophers, is best known for stating the limits of empiricism. It was Reid who thought Hume best of all signaled these shortfalls. Empiricism has no way of knowing the past, the future, minds, and other non-physical things not experienced directly by the senses. The more contemporary setting of the debate of evolution and creationism is also worth noting. Within the entrenched modern Darwinian philosophy of science empiricism has especially been presupposed and given an unquestioned authoritative role (usually expressed in scientism) within the worldview constructed from evolutionist and atheist argumentation or presentation of the evidences. There are no a priori concepts. Everything is derived from sense experience (a posteriori), verification of a proposition cannot be derived a priori. Everything that is truth is articulated by language that has propositions which can be verified by the five senses. Substantive empiricists grant a priori concept but think they are ultimately reducible to empirical concepts. A priori is considered that which is known independently of experience while a posteriori is considered that which is known through experience, or after experience (See: Epistemology). Rationalism maintains that being able to know something does not have to be through direct sensory input experience of the external world. Rationalism lays outside of sense experience, going past the experiential content of reality into a more abstract realm of logical inference and philosophical argumentation. Skeptical empiricism The belief that nothing should be believed unless it can be seen or "reasonably believed," in concert with a skepticism toward God and miracles. Example: Hume. Religious empiricism The belief that nothing should be believed unless it can be seen or reasonably inferred, in concert with an openness toward God and miracles. Example: Aquinas. Verificationism Verificationism today in the 21st century is characterized as a "latter-day incarnation of classical empiricism". ↑ "empiricism." Encyclopædia Britannica. Encyclopædia Britannica Online. Encyclopædia Britannica Inc., 2011. Web. 31 Oct. 2011. <http://www.britannica.com/EBchecked/topic/186146/empiricism>. This page was last modified on 4 March 2014, at 12:47.